Act-On is a marketing automation platform that is developed by digital marketing experts who collaborated on Amazon’s vaunted filtering based recommendation engine. Banking on the reputation of its founders, Act-On has performed exceptionally well despite the fact that the platform is still a newcomer in the marketing automation landscape. With the minds that have helped Amazon become a juggernaut in online commerce today, Act-On is loaded with features and tools that can easily perform at par with the leading marketing automation solutions out there. Act-On presents a powerful array of marketing automation features and business tools that can easily rival those of its contemporaries. 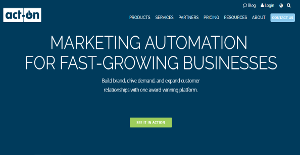 While a new comer to the marketing automation business, Act-On has already proven to be a serious marketing solutions provider to many types of businesses. Noted for its vast set of features and tools, the software is also known for its user-friendly setup, which allows users to create landing pages and get them up and running effortlessly. The very clean user interface is also worth noting. Setting up and running campaigns is also a walk in the park, even for those who are not keen on marketing tools. Website and visitor tracking is another strong suit. So is its set of social media marketing tools. A premium function by any standards, Act-On allows users to incorporate social media buttons to emails that are sent from its system. Traffic analysis also helps users to study actions and patterns that occur in their social media channels. Many users praise Act-On for its Powerful lead tracking tools, highly configurable campaigns, and excellent customer support. For those who really want to track inbound marketing data, Act-On allows users to get a good sense of which search terms are getting the most hits as well as activities from other measurements like Google PPC Tracking, referring sites, and more. Another significant benefit is Act-On’s capability to design and implement nurturing campaigns for leads. It is also integrated tons of business systems and applications, streamlining and accelerating workflows and processes, resulting in better efficiency and productivity. Every enterprise has different requirements and requires a software that can be personalized for their size, type of staff members and customers, and the specific industry they are in. For these reasons, no system can offer perfect tools out-of-the-box. When you search a software system, first be sure what you want it for. Read some Act-On reviews and ask yourself do you want basic functionality or do you want advanced functionality? Are there any industry-specific tools that you are seeking? Obtain the answers to these queries to assist your search. There are multiple aspects that you need to reflect on and these include your finances, specific business needs, your company size, integration needs etc. Take your time, check out a few free trials, and finally select the platform that offers all that you require to improve your organization efficiency and productivity. How Much Does Act-On Cost? We realize that when you make a decision to buy Marketing Automation Software it’s important not only to see how experts evaluate it in their reviews, but also to find out if the real people and companies that buy it are actually satisfied with the product. That’s why we’ve created our behavior-based Customer Satisfaction Algorithm™ that gathers customer reviews, comments and Act-On reviews across a wide range of social media sites. The data is then presented in an easy to digest form showing how many people had positive and negative experience with Act-On. With that information at hand you should be equipped to make an informed buying decision that you won’t regret. What are Act-On pricing details? What integrations are available for Act-On?